Members of the Cape Town Amateur Radio Centre are advised that the Annual General Meeting will be held on Saturday 26 July at 14h00 C.A.T. at the usual CTARC clubhouse venue in Rondebosch. Please diarise this forthcoming AGM date now. At the meeting, the new CTARC committee will be elected, the formal minutes of the previous AGM read, the financial statement declared and the various prizes and floating trophies handed out. Various AGM documents will be e-mailed presently to those CTARC members who are contactable by e-mail. Soup and rolls will be provided, and beers and cooldrinks will be on sale. Club members who were awarded CTARC trophies at last year's AGM are kindly requested to return them to the CTARC at the June meeting on Saturday 28 June at 14h00 at the clubhouse. The July AGM is the usual time for club subscriptions to be renewed, so please bring those along with you, if you have not done so in advance. Subscriptions can also be paid by EFT. 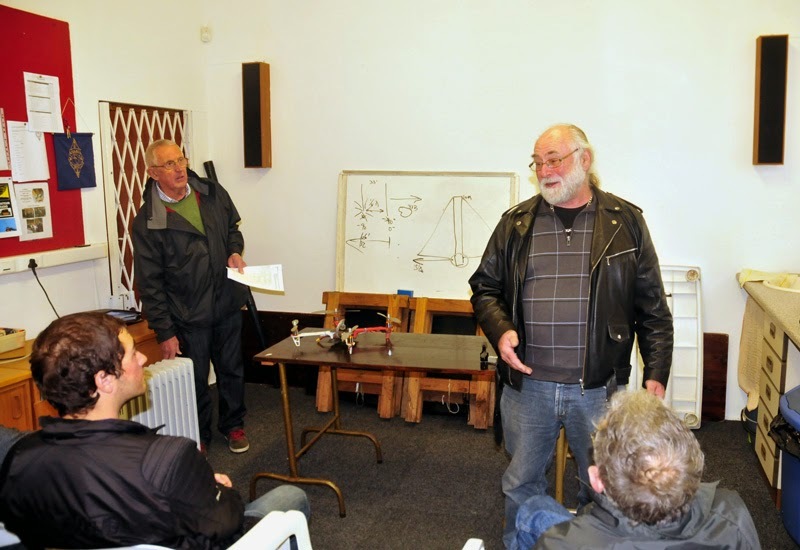 Members and friends ot the Cape Town Amateur Radio Centre are advised that the following monthly meeting will take place on Saturday 28 June at 14h00 C.A.T. The May 2014 edition of Ragchew has been published. You can access it directly [here] or on the CTARC Newsletters page [here]. Grateful thanks to Anne for another excellent newsletter! Please note that after the June edition, the CTARC's Ragchew Newsletter will be published every two months, so we can look forward to the next edition in August of 2014. 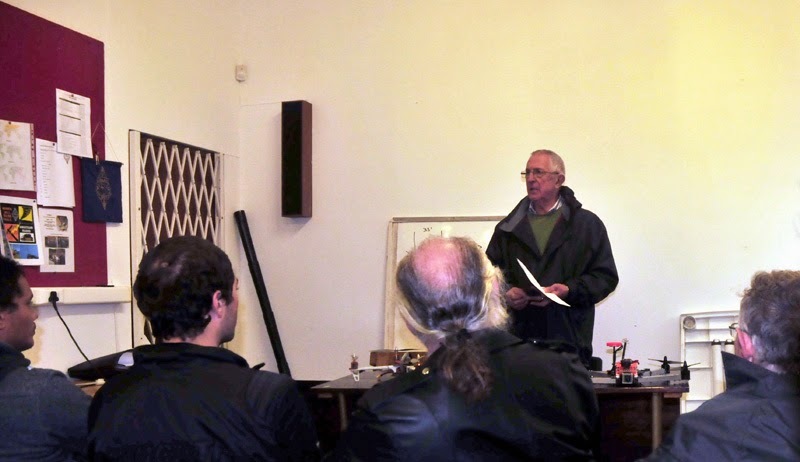 On Saturday, 24 May 2014, the Cape Town Amateur Radio Centre held its monthly meeting at at 14h00 at the clubhouse in Rondebosch. Noel, ZS1FW opened the meeting and spoke about some of the challenges that face our club and Amateur Radio societies in general. We held a brief but poignant moment of silence in memory of the late Martin Holland, /ZS1SM /sk. We will all remember the "Stasie Meester" with fondness. 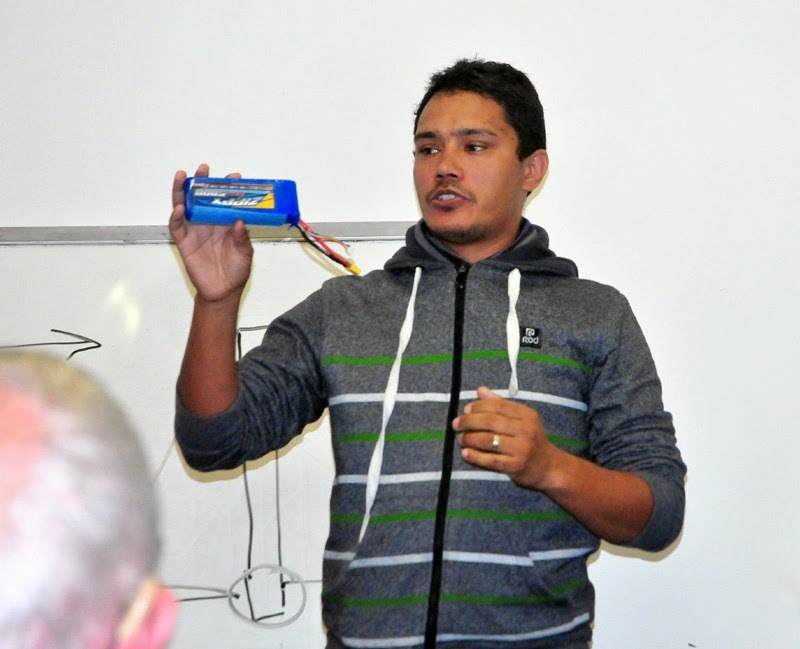 Rob, ZS1SA discussed the need to appoint somebody to assist with responsibility for managing the CTARC's antennas. 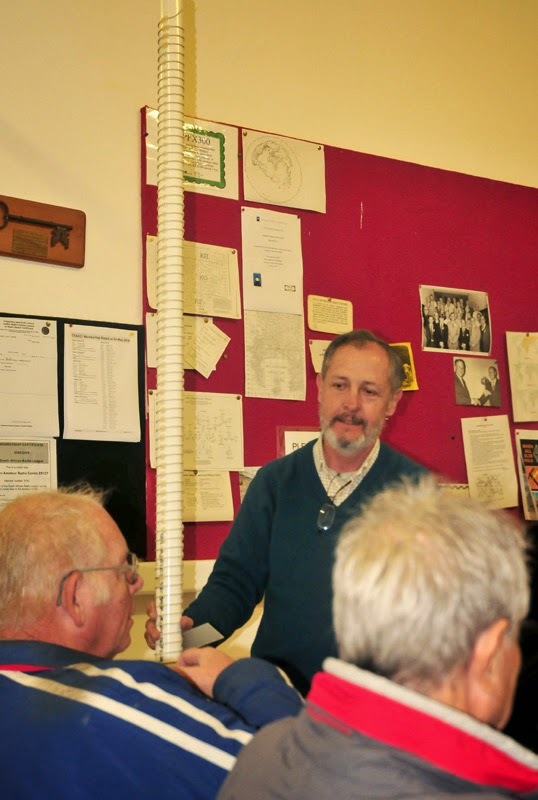 Paul /ZS1S, also showed a helically-wound element of an 80m band antenna that he intends using in the field, soon. The regular spacing of the windings was maintained by an ingenious comb arrangement. 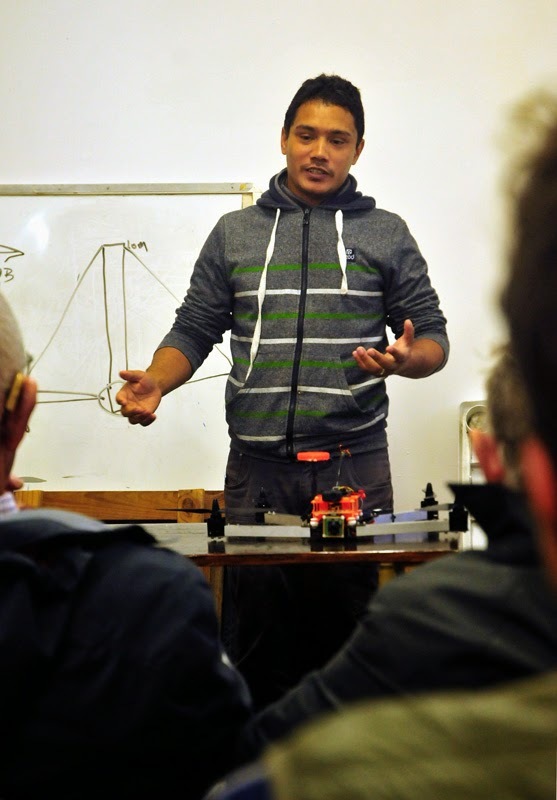 Then, those of us who had braved the incoming stormy weather were rewarded with a fascinating talk and demonstration by Garth, on the topic of Drones and Unmanned Aerial Vehicles. 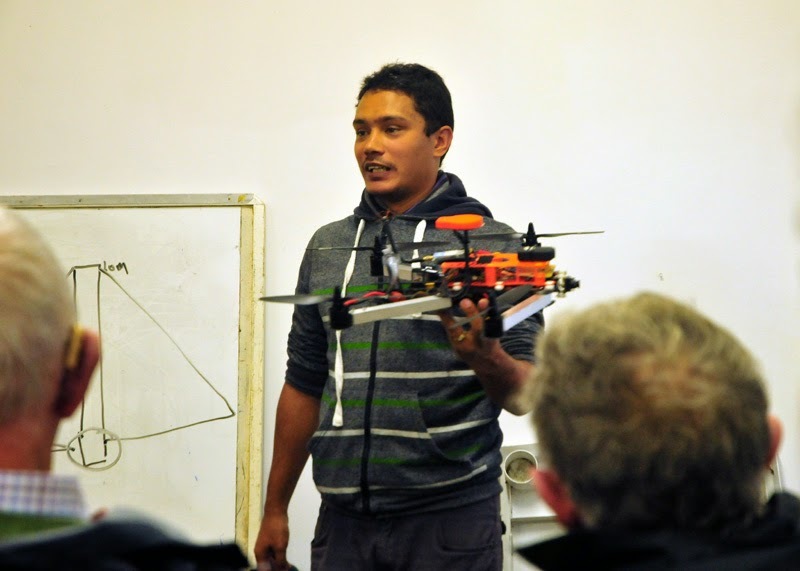 Garth brought along two quadcopters and a fixed-wing aircraft to show us. 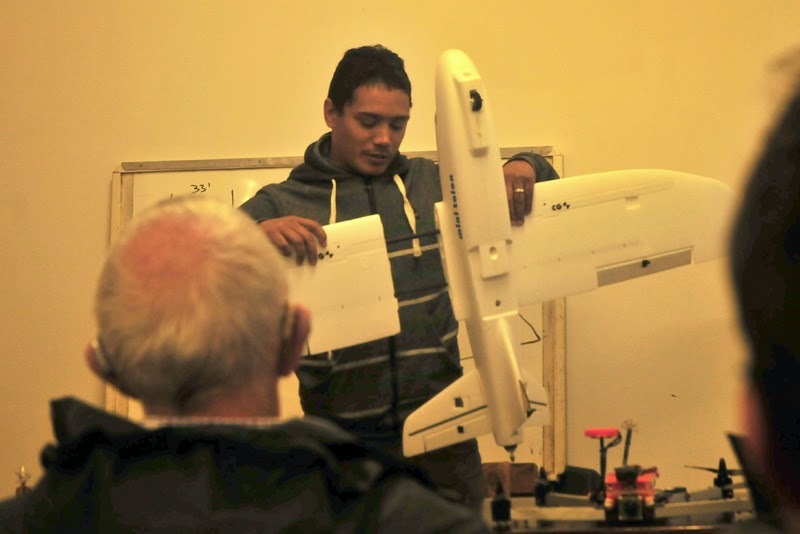 He gave some very interesting insights into just what these amazing remote-controlled aircraft are capable of, as well as the rapidly evolving technology that is used to keep these craft both airborne and stable in flight. 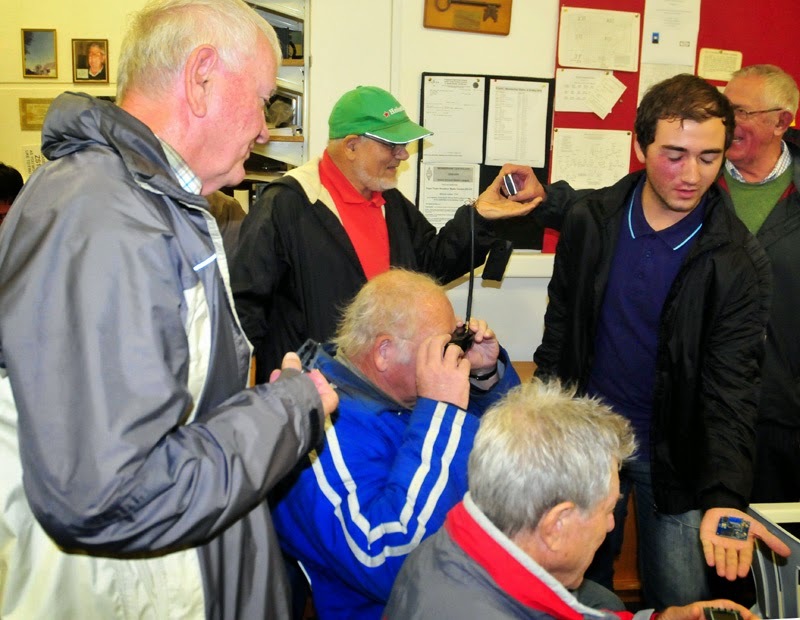 Members of the audience were given the opportunity to ask questions during and after the talk, as well as the chance to see the live view through video goggles used by the pilot when flying a "first-person view" type of UAV. Afterwards, attendees remained for the usual greetings and chats before driving home through the gathering storm. Thanks so much to Garth for his contribution; also to Matt /ZS1MTF for arranging for Garth to come and deliver his excellent talk. A most interesting meeting indeed! Garth also spoke about the safety aspects and regulation of UAV's, which are a technology that has advanced way ahead of current CAA legislation, which is expected to be published some time in 2015. UAV's all have GPS technology that enables them to navigate, to remain stable and even to hover on the spot, even in fresh winds. Some versions can even return to their launching positions automatically if they lose signal from the ground-based controller! 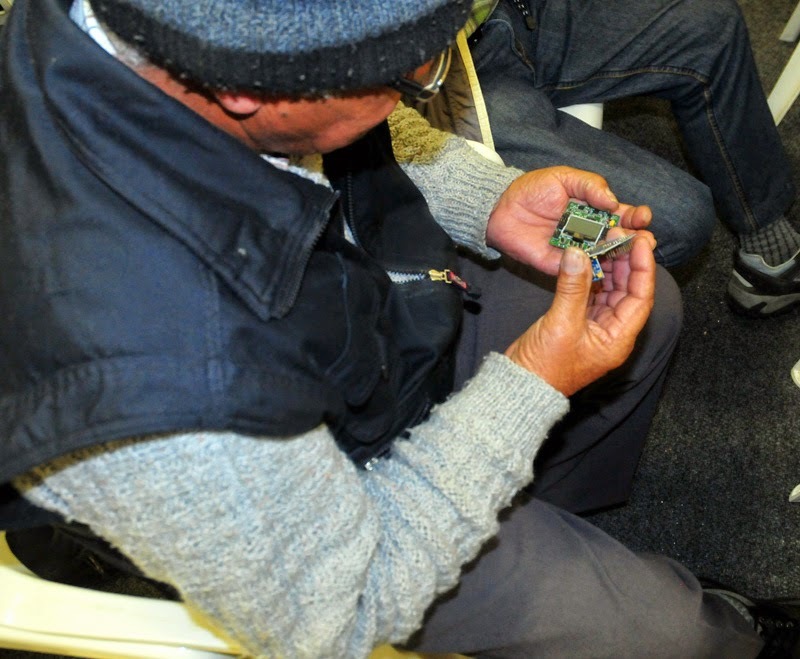 Richard /ZS1RIC examines the tiny control modules that are the CPU's of each UAV. 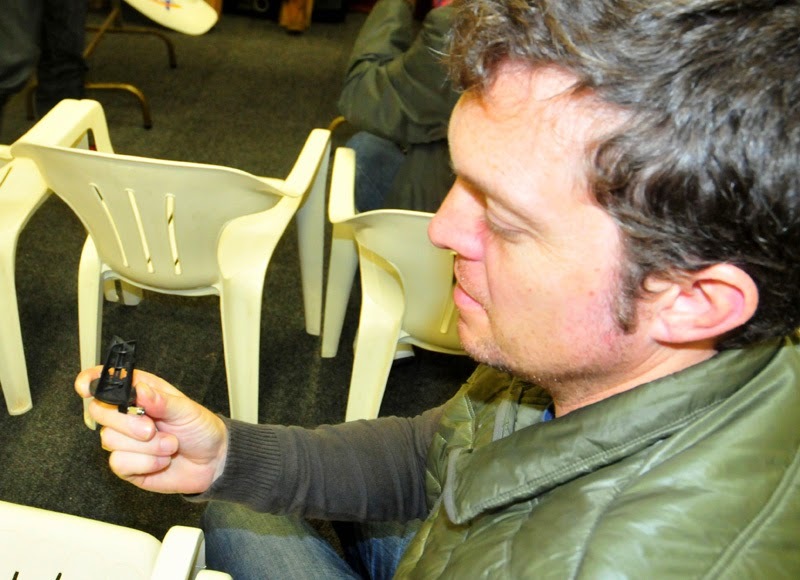 That's a tiny helical UHF antenna that Phil is holding. Typically UAV's will have a separate antenna for the PCM-coded control signals (and feedback), and another antenna for streaming video. While Matt /ZS1MTF shows various UAV bits & pieces, in the background Davey /ZR1FR shows Noel /ZS1FW (via cellphone video) a somewhat unconventional UAV application that certainly caught people's attention at a recent rally! 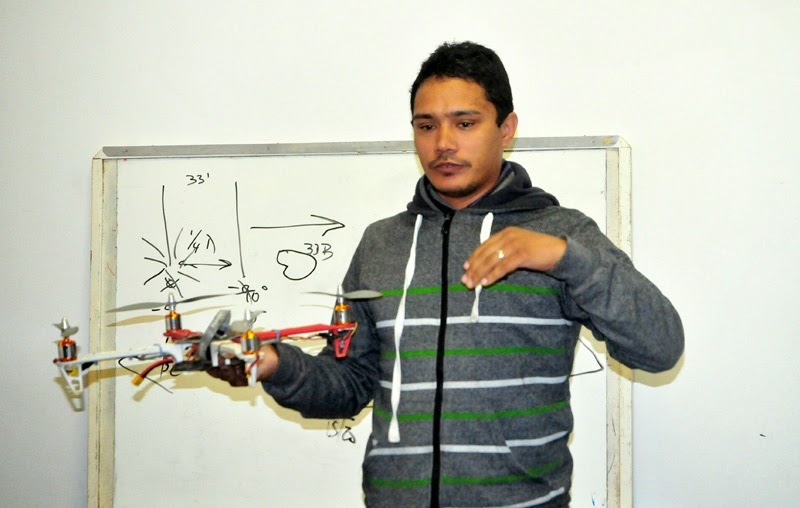 Richard takes a peek at the First-Person Point-Of-View video goggles that can be used to pilot the UAV. This one provides a monochrome video, but colour versions are available on the more expensive UAV's. Amazing technology! 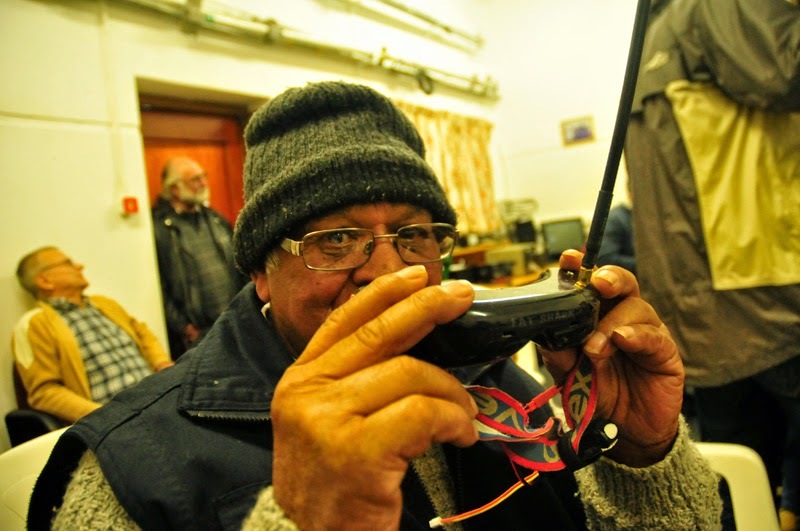 The next monthly meeting of the Cape Town Amateur Radio Centre will be held at 14h00 on Saturday 24 May 2014. The venue, as usual, will be the CTARC Clubhouse in Rondebosch. Committee members of the Cape Town Amateur Radio Centre are reminded that there will be a committee meeting on Monday 19 May at 19h00.